If you’ve been thinking about installing landscape lighting around your home, you may have already visited a home improvement store. If you have, then you know first-hand just how overwhelming the options can be. There are literally hundreds of different options. You’ll see options like temperature, angle, type of bulb, just for starters. If you’re feeling stuck, Night Vision Outdoor Lighting can help. We’re going to explain all those different options for picking lights for outdoor landscape lighting. It may seem like there are hundreds of different options. But if you know what you are looking at, you will start to see that the options fall into categories. The first choice you have to make is the type of bulb. 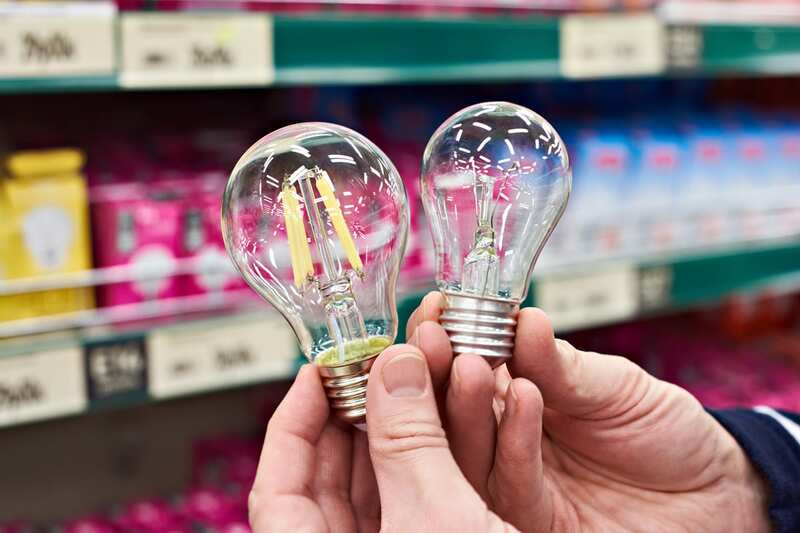 Incandescent bulbs are the most common bulbs at home, but not outdoors. For landscape lighting, you will mostly see halogens, high pressure sodium, and LEDs. Then you have your choice of color temperature. Along with color temperature, you will see lamps rated by lumens. Finally, you have your choice of fixtures, from floodlights to bullet lights and everything in between. The first thing to know is that in professional outdoor lighting circles, what you call a bulb at home is called a lamp. In the past, your options for home lighting were limited to a few color shades and a few brightness levels. You had soft-white, cool-white, and more recently daylight type bulbs. The brightness of a lamp could be determined by its wattage, from a dim 40-watt bulb to a bright 100-watt bulb. Today, the choices are much broader but at the same time much more specific. With advancement in energy efficiency, wattage is no longer an accurate measure of brightness. And newer technologies give you more control over the type of light your lamp emits. High pressure sodium lamps provide a lot of light for the wattage. Their bright light and high energy efficiency have made them a classic staple of outdoor lighting. However, they have a very specific color. High pressure sodium lights are responsible for the orange glow of old street lights and lit up commercial buildings. For home landscape lighting they are often undesirable for that reason. Halogen is a good alternative to high pressure sodium lamps. They are cheaper and still bright, although not as bright. They also have a much more “natural” light spectrum. For this reason, halogens dominated outdoor landscape lighting for decades. A small halogen light can produce a lot of light. They are often used as floodlights for residential and commercial applications. However, as LED technology has advanced, the less efficient halogen lamps are slowly disappearing. LED lamps are the current state of the art for outdoor lighting. They are extremely energy efficient, have a long life, and can produce many different shades of color. LEDs can provide very bright light with relatively low wattage. Depending on the desired effect, LEDs are available in many shades. Available shades rang from a deep yellow, similar to high pressure sodium lamps, all the way to a cool bluish light similar to midday sunlight. Night Vision Outdoor Lighting uses LED lamps exclusively. Their high energy efficiency and long lifetime make them ideal for residential use. With LEDs, you don’t have to change the lamps as frequently, making them easier to own and maintain. And the variety of shades of light mean that Night Vision Outdoor Lighting can customize the look of your lighting. It used to be the case that wattage and brightness were directly correlated. A 40-watt incandescent bulb was relatively dim, while a 100 watt or higher bulb gave a bright light. However, as new bulbs, and especially LEDs, become much more efficient, wattage has become a less accurate measure of light output. A very bright LED may use much less than 40 watts. Instead of using wattage as a measure of brightness, modern lighting packaging lists “lumens”. Lumens are a direct measure of the actual light output of a bulb. A 40-watt tradition incandescent bulb produces about 450 lumens. A similar 100-watt bulb produces about 1600 lumens. If you are new to LED lamps, you may be unfamiliar with light temperature. Simply stated, the temperature of light is a measure of how warm or cool a light is. Paradoxically, color temperatures in the 2700-3000K range are warm and yellowy, while temperatures in the 4000-5500K range are cool and blue. To understand this seemingly backward system, you need to understand the term “temperature” in relation to light color. Color temperature, measured in degrees Kelvin (K) is the temperature at which a black body would emit radiation of the same color as a given object. Imagine a piece of black metal being heated by a blacksmith. As it is heated, the black metal begins to glow red. This is a relatively low color temperature (1800K is equivalent to candlelight). As the temperature of the metal increases, it starts to glow yellow (2700K), then white (4000K+). If it was heated enough, it might theoretically start to glow in an almost bluish shade. That’s color temperature in a nutshell. When choosing lamps for landscape lighting, color temperature is of utmost importance. The first rule is to avoid mixing color temperatures. Shining a yellow light next to a white light can be jarring and look messy and unappealing. Instead, consider the application and decide on a temperature to stick with. You can shift temperatures in separate areas, but you want to avoid too much mixing in one view. In general, 3000K is a good place to start. It is roughly equivalent to the once ubiquitous soft white incandescent bulbs you use in your home. It provides a light with relatively good color rendering that is easy on the eyes. Now that you know a bit more about lamps and how they are categorized, you may be more comfortable selecting your own lights. However, experience definitely plays a role in finding the best lights. Make sure that you have a plan for your lights, but you don’t have to do it alone. Night Vision Outdoor Lighting has completed thousands of lighting projects and wants to help make yours a success. So if you are ready to dive into the world of outdoor landscape lighting, contact us today. Let’s get started creating the best lighting for your home!